Lori had the opportunity to study radio and television production while at Douglass College (Rutgers University) and realized she had a knack for all things technical. She also found creative outlets working at WCTC Radio as an advertising copywriter and occasional voice-over artist. 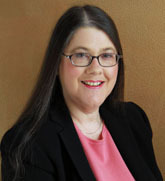 Lori began her professional career as a quality control supervisor for a small computer company in Princeton, and spent eight years as an outside plant engineer with New Jersey Bell (now Verizon). In 1985 Lori joined husband Ron in his printing business and Media Trends was established soon after. Lori has accumulated many years of experience in graphic arts, newspaper production, photography, computer applications, technical training and business management. Lori is an expert user of many publishing and graphic art programs including QuarkXPress, Microsoft Publisher, Adobe InDesign, Photoshop, Illustrator and Acrobat. She holds workshops in newspaper layout and Photoshop for many of Media Trends' customers. Lori is both the general and financial manager of Media Trends. Her experience and personal attention to detail guarantee your project will be handled professionally and to your satisfaction. She will make sure you get a quality publication at the best possible price.